Howard White is a Sydney-based author. Prior to his first children’s book, his vocation principally involved the preparation of corporate policy and planning, with all the attendant strictures and business protocols required in writing in that genre. He has been an independent consultant, worked for some years in the administrative area of the NSW Department of Education, and briefly, taught English subjects to students in the Technical and Further Education system. He has a Bachelor of Social Science degree, and a Master of Business Administration degree. However, his principal qualification for writing for children is that he has six grandchildren, who provided the inspiration for Grandad’s Glasses. The grandchildren’s guileless approach to learning about their world, and their innocent teasing of Grandad’s idiosyncrasies is a constant source of wonder and delight. 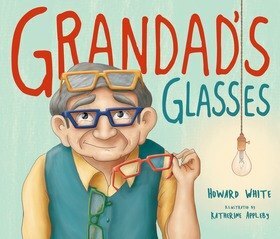 The events depicted in Grandad’s Glasses are true, so beautifully captured by Katherine Appleby’s marvellous illustrations.